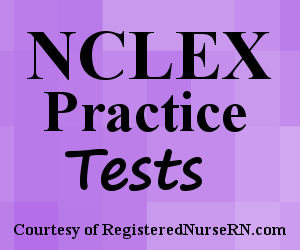 Quiz that contains NCLEX questions for myxedema coma. Myxedema coma is a complication of untreated or undiagnosed hypothyroidism. As the nurse taking care of a patient with hypothyroidism, it is important you know the typical signs and symptoms, causes, and treatments. The NCLEX exam loves to ask questions about patient education, common side effects of medications, and major signs and symptoms the patient can exhibit with myxedema coma. It is important to not confuse myxedema coma with thyroid storm , which is a complication of hyperthyroidism. This NCLEX quiz will test your knowledge about myxedema coma which is a complication of hypothyroidism. A. A 28 year old female who is prescribed Methimazole. B. A 75 year old female who is taking Lithium and reports missing several doses of Synthroid. C. A 69 year old male experiencing nausea and vomiting for 4 days. D. A 55 year old male with a history of diabetes and is insulin dependent. A. Avoiding green leafy vegetables. B. Importance of taking Tapazole exactly as prescribed at the same time every day. C. Limiting foods with Iodine such as kelp, dairy, and eggs. D. Importance of taking Synthroid in the morning without any food. 1. Which of the following patients are MOST at risk for developing myxedema coma? 2. All of the following are treatments for myxedema coma EXCEPT? 3. A patient is receiving treatment for myxedema coma with IV Synthroid. Which of the following findings would require nursing intervention for this patient? 5. A patient taking IV Synthroid starts to complain of feeling hot and chest pain. On assessment, you find that the heart rate is 125 bpm and blood pressure is 200/103. You immediately notify the physician of the patient’s condition and receive orders for lab work. Based on the patient’s signs and symptoms, what is the MOST important lab result at this time to determine the cause of the patient’s symptoms? 6. A patient is recovering from myxedema coma and will be discharged tomorrow. What will you include in their discharge teaching? 7. Which of the following are NOT a cause of myxedema coma?